This article has been discussed on Twitter today. It purports to show that you don't need to read the ECG if the computer says "normal". Many on Twitter seem to agree. The confidence intervals were 97-100%. Would you like to be 97% sure you're not missing an emergency? So I just looked through a few of my blog cases that were read as "normal" by the computer. Just as an aside: we are just finishing a manuscript studying a deep neural network EKG algorithm. We compared the new deep neural network (DNN) from Cardiologs technologies(DNN) to Veritas conventional algorithm: Veritas: 364 "normal"; 5 missed emergencies. DNN: 493 normal; 2 missed. So things will get better as technology advances. A 50-something with diabetes presented with 3 hours of sharp chest pain radiating to the left hand, with dyspnea and diaphoresis; it was worse with exertion and with lying flat. He had this second ECG, which was texted to me and I looked at it on my iPhone. At the time of this ECG, the patient had received NTG and the pain was decreasing. There is 1 mm of ST elevation at the J-point in both V2 and V3 (within normal limits). More description: There is also poor R wave progression, with small R waves in V4. The T waves are slightly broad and large, but probably could not be called hyperacute. There is minimal STD in aVF. "3 hours of chest pain, QTc = 415 ms, 3 variable formula is 25.3. What do you think?" A value greater than 23.4 is very worrisome for LAD occlusion. I showed it to Pendell Meyers, and he said: To me it looks like it could be "on the way down" from LADO. The only way to prove it is with serial ECGs and the rest of the clinical story. The first troponin I returned undetectable. At about 3 hours after ECG-1, the second troponin I returned at 0.097 ng/mL. At this time, the patient became pain free. Now there is less than 0.5 mm of ST Elevation. Some people have nearly zero ST elevation at baseline. There is still only minimal STE. T-waves in V2 and V3 are slightly less tall. ECG-5. Later I discovered that there was an even earlier first ECG, recorded 50 minutes prior to ECG-1. This has a lot of artifact. It was called normal except for artifact. notice the T-wave in V2 is 8 mm, whereas it is 5 mm in the first ECG above. As it turns out, the ECG at the top (ECG-1) was done after nitroglycerine, and the patient's pain had diminished "from 6/10 to 4/10." This shows that the T-waves (which never were quite hyperacute), are deflating and may have been hyperacute prior to arrival. The third troponin I, drawn 4.5 hours after presentation, returned at 4.2 ng/mL. The patient went for angiogram and had an 80% mid-LAD thrombotic stenosis and proximal LAD disease, as well as a 90% diagonal lesion. He went for Coronary bypass (CABG). This outcome is perfectly consistent with all the ECGs. 1. Pay attention to diminishing T-wave amplitude during diminishing pain. 2. The formulas are very accurate. I have always thought that I can do better than my formulas, but now I'm in doubt. 3. Some patients have near zero ST elevation at baseline. Any ST elevation in these patients is abnormal. In such patients, LAD occlusion may result in very subtle ST elevation. Here is another case written by Pendell Meyers, a G2 at Stony Brook. As I mentioned before, Pendell will be helping to edit and write the blog. It is edited by Smith. This case might be quite obvious for long-time readers of this blog, but there is an interesting twist. A male in his 50’s with no medical history presented at time = 0 complaining of chest pain for the past few hours. He was hemodynamically stable, with a normal physical exam. He had been given aspirin 325 mg via EMS. Sinus Rhythm. There is approximately 1mm STE in aVL with reciprocal STD in II, III, and aVF. There is STD in V3-V6, with hyperacute T waves (de Winter's morphology) in V3-V6 and also hyperacute T waves in leads V5, V6, and I. This is unequivocally diagnostic of acute transmural injury to the anterior and lateral walls, with the most likely etiology being acute occlusion (or near occlusion) of a coronary artery supplying these walls, such as the LAD, large diagonal, ramus intermedius, or sometimes the LCX or its branches. STE in the lateral leads with STD in precordial leads might lead you to diagnose posterolateral STEMI, believing that the ST depression in V3 is reciprocal to ST elevation in the opposite wall. One might also believe that posterior STEMI is diagnosed in the presence of right precordial STD with an upright T-wave, as we have in this case. First, posterior STEMI does not always have an upright T-wave (see the explanation at the bottom of this post: Right precordial ST depression in a patient with chest pain). Acute posterior STEMI with persistent occlusion may present with an upright T-wave, but it may also have an inverted one. Only reperfused or subacute posterior STEMI consistently has an upright T-wave. Second, and more important, the upright T-wave is very large. Again, posterior STEMI which is reperfused (pain gone) may have a large, hyperacute appearing T-wave ("posterior reperfusion T-waves": see 2 Examples of Posterior Reperfusion T-waves), but acute posterior STEMI with active pain does not. This morphology is distinctly de Winter's T-waves (article: "Persistent precordial “hyperacute” T-waves signify proximal left anterior descending artery occlusion"; here is full text). The de Winter pattern is characterized by ST depression and hyperacute (large) T-waves in the distribution of the ischemia. This is in contrast to upright T-waves from posterior MI, and also in contrast to the inferior ST depression in this case, which is reciprocal to the STE in aVL. In de Winter's T-waves, if the ischemia worsens before reperfusion, the ST depression may evolve into ST elevation with or without hyperacute T-waves. The physicians who read the ECG documented that they saw ST-depression in III and aVF, but that they did not appreciate any definite ST-elevation on the ECG. Not much change, but perhaps slight improvement in some ST segments. An initial troponin I returned at 0.10 ng/mL (slightly elevated) at time = 49 minutes. Definite improvement in ST segments and morphology. There remains subtle STE in aVL, now with an inverted T wave consistent with reperfusion, along with slight STD in II, III, and aVF. The decrease in chest pain and improvement in the ECG implies at least partial spontaneous reperfusion (thrombus autolysis) or reperfusion through collaterals. Rate of 75 bpm is by definition not VT. 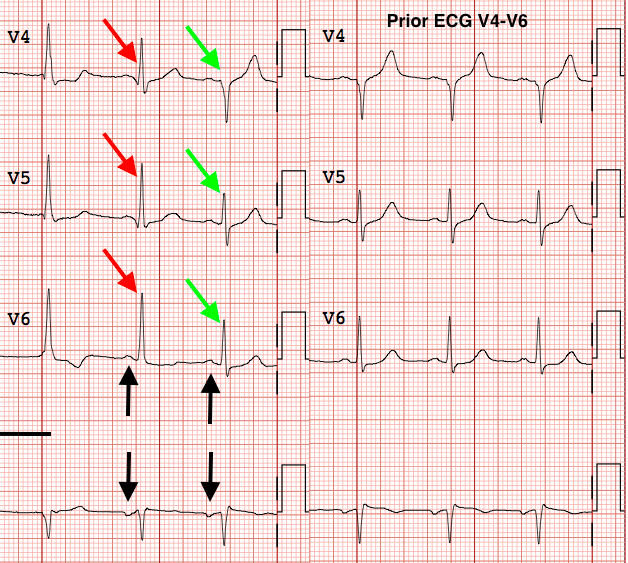 The morphology does not match LBBB or RBBB, and there are no pacer spikes. No particular features of hyperkalemia or Na channel blockade, but lack of these features should not be a reason to stop thinking about hyperkalemia in particular. Thus we are left with NSICD, cardiomyopathy, hyperkalemia, and AIVR (a benign and transient rhythm associated with successful reperfusion). For the sake of education, let us suppose for a moment that the clinical scenario was not obviously in support of AIVR (because sometimes it won't be! ), and take a closer look at the ECG. The black arrows point out some sort of atrial activity which is likely present throughout the tracing but may be hidden within QRS complexes where it is not marked by the arrows. The atrial waves do not have a fixed relationship with the wide QRS complexes, and are therefore dissociated, indicating they are competing with the wide complex rather than causing it (with an exception at the end of the ECG which we will discuss). When there is a wide complex rhythm, you must check all the leads and the full rhythm strip to make sure that there are no QRS complexes with alternative morphology. If you do find a QRS with a different morphology (especially when it is narrower than the predominant rhythm), you should analyze it carefully for clues. The long black line shows the duration of the predominant wide complex rhythm. If you weren't looking carefully at all 12 leads, you might not have noticed that it is interrupted at the very end, in leads V4-V6 and the associated rhythm strip below. As sometimes happens, the change in QRS morphology and width is not easily seen in the rhythm strip, and is only revealed in leads V4-V6. There are two QRS complexes which have differing morphology from the prior predominant wide complex rhythm, marked with red and then green arrows. These QRS complexes are narrower than the prior wide complex rhythm; in fact, the QRS marked with green arrows is very narrow. The finding of a truly narrow beat is important for the differential. Hyperkalemia present on a cellular level cannot vary on a second-to second basis. If hyperkalemia is so severe to cause acute widening of the QRS complex, you cannot possibly conduct a single truly narrow QRS complex beat in the middle of your hyperkalemia-widened rhythm. The same is true for Na channel blockade, severe acidosis, and cardiomyopathy. Bundle branch blocks, on the other hand, can sometimes vary on this time frame, as they are an "all-or-nothing" event that depends whether that single cell in the bundle branch was refractory or not at the precise instant the action potential arrived and asked permission to proceed down the bundle branch. The QRS complex marked by green arrows has identical morphology to the patient's prior normal sinus rhythm. It appears as though the atrial activity which had been competing (and "losing") against the wide complex rhythm, begins to take back over at the end of the ECG (and/or the AIVR is subsiding). As it starts to do so, it creates a fusion beat (QRS marked by red arrows) which results when a supraventricular action potential merges in the ventricles with a ventricular action potential. 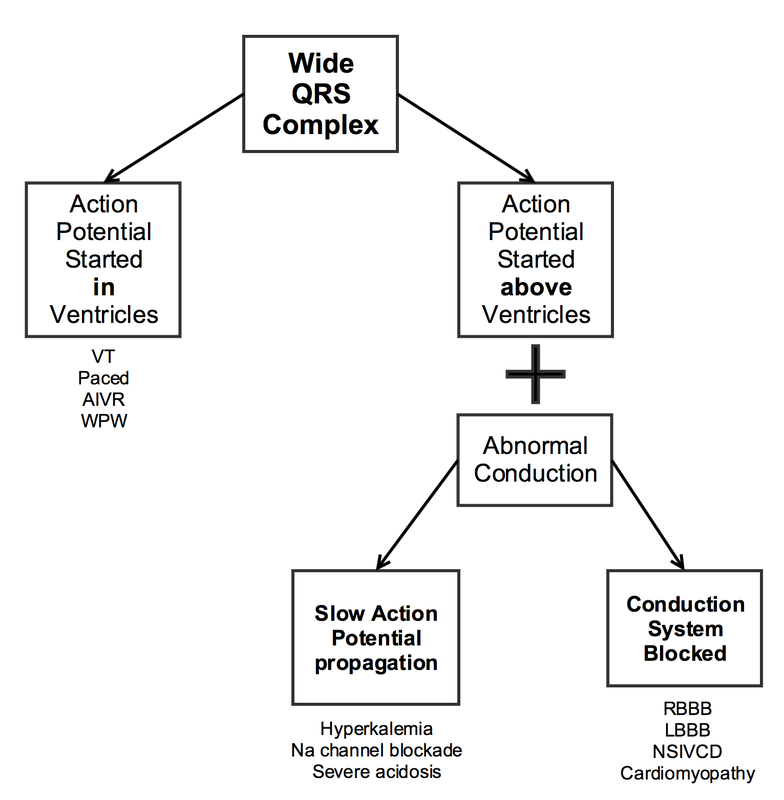 In the very next beat, the atrial activity comes early enough to usurp the AIVR beat and thus to produce a fully supraventricular QRS complex [narrow and with identical morphology to prior (green arrows)]. As previously alluded to, this is an accelerated idioventricular rhythm (AIVR), which is a classic but relatively unusual sign of reperfusion. It often has a stereotyped morphology with very large/tall monomorphic positive complexes in the inferior leads, with the obligatory reciprocal ST-segment and T-wave changes that come with any abnormal QRS complex. The second troponin returned elevated at 4.98 ng/mL at time = 2 hours, 28 minutes. No further troponin measurements are available. The patient was noted to be pain free at this time. Cardiology was called due to the elevated troponin and came to see the patient. Continuing reperfusion with decreasing ST deviations and normalizing T waves, but persistent inverted (reperfusion) T wave in aVL. This finding is consistent with the suspicion that he had total or near-total occlusion at the time of pain and at the time of the first ECG. Recognizable acute coronary occlusion is missed frequently due to poor ECG interpretation, and in this case resulted in at least a 3-hour delay in necessary reperfusion therapy. In the presence of active symptoms (e.g., chest pain), ST depression followed by a large T-wave in the precordial leads is a sign of occlusion of the LAD or one of its large branches, and these are referred to as "de Winter's T-waves." Fortunately, sometimes when these ECGs are missed, the thrombus "autolyses" and the artery reperfuses without therapy (or as a result of aspirin). Luckily, this patient reperfused during the delay. Acute coronary occlusion frequently does not manifest the ST elevation millimeter criteria for diagnosis of STEMI. ST-depression in a coronary distribution should activate a "hard stop" in your mind to look for signs of acute coronary occlusion (ST elevation, even if minimal) in the opposite (reciprocal) distribution. AIVR is a rare clue that also points toward the diagnosis of reperfused acute coronary occlusion. Understanding of the differential for a wide QRS complex and recognition of common QRS patterns is key to ECG interpretation. Breaks in the rhythm and interjecting narrow complex beats contain vital clues to the evaluation of a wide QRS complex rhythm. Here are 10 more cases of de Winter's T-waves. Is the LAD really completely occluded when there are de Winter's waves?